But ironically, the flood of new technology -- smart phones, 4G data connections and so forth -- has also helped drive the trend. It's made driving around the country for weeks at a time a much less daunting prospect. People like Gerrad Archibald and his wife Krista, both 39, are helping to pull down that average age. 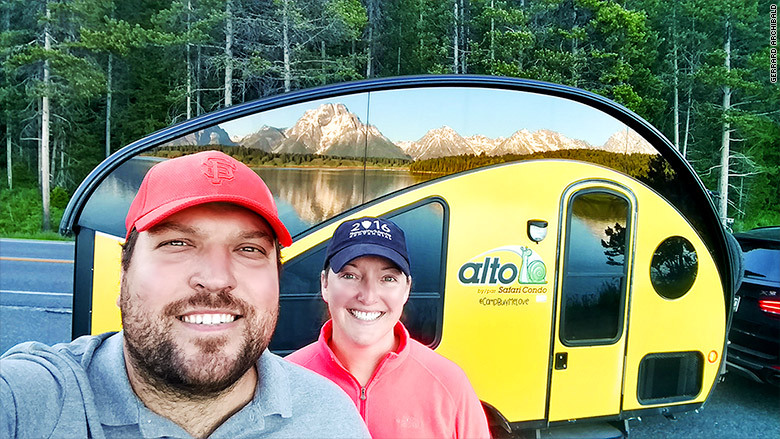 For seven months, they've been connecting the dots between America's national parks in a BMW SUV towing a small Alto pop-up trailer. "It's like a jewel on the campground," Krista said of their tear-drop shaped trailer. "Everyone wants to see it." Gerrard and Krista Archibald have been touring America's national parks in their pop-up trailer. 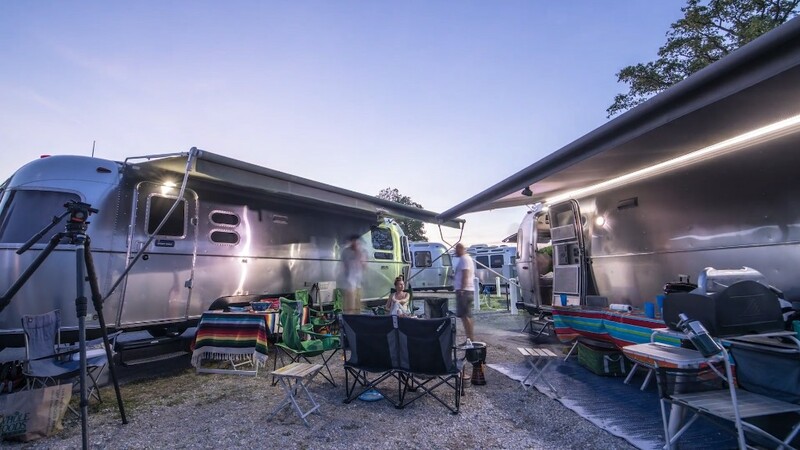 Airstream has been chasing younger campers like them with its new Basecamp trailer. It takes the classic shiny aluminum Airstream look and wraps it around a compact trailer with a cool retro-modern interior. "[Saying] that Basecamp has been a runaway success is an understatement," said Airstream CEO Bob Wheeler. "Our original production plans were 10 a week. We're now making 25 a week. We have a wholesale backlog out until the end of this calendar year." Trailers like the Basecamp are relatively inexpensive, with prices starting at under $40,000. Motorhomes, the luxury condos of the road, are a different story. Prices for those can easily reach six figures. That points to another big factor in the rise of the RV lifestyle, which is that loans are easy to get. "You can see terms as long as 20 years," said Winnebago CEO Micheal Happe. So it is more like investing in a second home than it is investing in another automobile." Prices for the Winnebago Vista LX start at over $130,000. Rising motorhome sales are a boon for automakers, too. 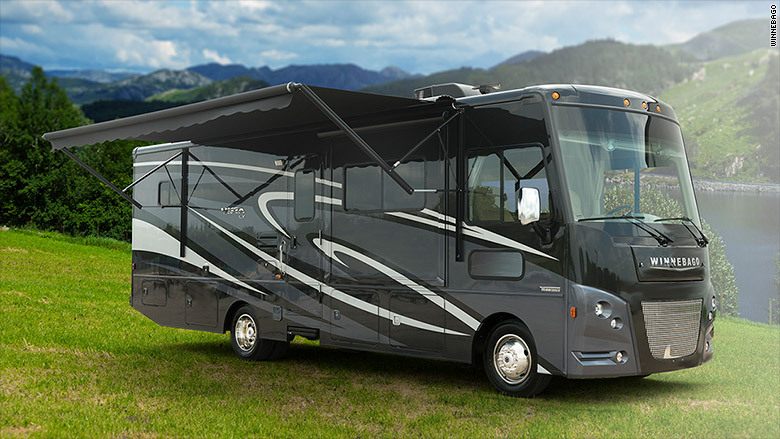 Ford Motor Co. (F), for instance, makes the chassis, engines and transmissions for most of the motorhomes sold in America. That business has been booming, Ford says. And Kampgrounds of America, with its famous KOA RV campgrounds, reports that business is the best its ever been in the company's 57 years. Now the industry is working on exports. As of now, the vast majority of RV's exported from the United States never go farther than Canada. But industry representatives are working hard to get China into camping.